A serendipitous discovery made by Dr. Nick Longrich (University of Bath), whilst exploring the fossil collection of the Yale Peabody Museum (New Haven, Connecticut) has helped to provide a tantalising glimpse into the Late Cretaceous dinosaur fauna of North America. The fragment of upper jaw bone (maxilla) has been identified as coming from a early member of the horned dinosaur family and it reinforces the idea that thanks to the Western Interior Seaway, the dinosaurs on the eastern part of the landmass that we now know as North America were very different and genetically diverging from the dinosaurs living on the western part of the continent. Although to the casual observer the fossil specimen looks like a mere scrap of fossil bone, this is the first evidence of a horned dinosaur found in eastern North America. 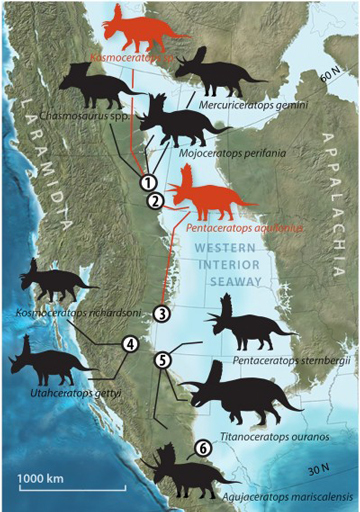 First fossil evidence of Ceratopsians in eastern North America. Described as being about the size of a Labrador dog, Dr. Longrich has not been able to assign a genus to his fossil find. However, this does represent a new species, one that is difficult to name given the lack of fossil material. Dr. Longrich (from the Milner Centre for Evolution, part of the Department of Biology and Biochemistry at Bath University), was examining some of fossils held in the collection of the Peabody Museum at Yale University when he noticed the jaw fragment. It had been found on a farm in North Carolina in 1985 and labelled as a maxilla from a duck-billed dinosaur. Intrigued by the bizarre shape of the bone and not being able to place the maxilla within any hadrosaurid genus that was familiar to him, Dr. Longrich decided to study this fragment in greater detail. Various views, dorsal, lateral, ventral etc. Although the fossil bone was only around four centimetres in length, Nicholas was able to compare this fragment of upper jaw with other Ornithischian dinosaurs and the short teeth sockets, the tooth socket arrangement in the jaw and their shape and the way that the toothrow curved led him to assign this fossil to the Leptoceratopsidae family. The Leptoceratopsidae are a family of ceratopsids known from fossil finds from Asia and North America, although some fragmentary fossils from Sweden and Australia have been assigned by some authors to this family. They are characterised by their small size (less than three metres long), presence of a neck frill but no horns other than pronounced jugal bones. They may have been facultative bipeds, mostly walking on all fours but with the ability to walk or run on their hind legs should the need have arisen. Regarded as basal Ceratopsians, this is a bit of a misnomer as the group persisted until the very end of the age of dinosaurs with a number of species living alongside the giant quadrupeds such as the better known horned dinosaurs such as Styracosaurus, Triceratops and Centrosaurus. The number of genera in this family has been swelled in recent years due to a number of new fossil discoveries such as Zhuchengceratops from China and Gryphoceratops and Unescoceratops from southern Alberta (Canada). The maxilla has some unique autapomorphies (unique anatomical characteristics). It is long, narrow and down-curved, this suggested a specialised feeding strategy. What exactly this little herbivorous dinosaur fed on is open to speculation but during the time when it lived (around 77 million years ago), the flowering plants were rapidly evolving. Perhaps, it evolved to feed on a certain group of plants that represented the undergrowth of forests and woodlands. During the later stages of the Cretaceous, rising sea levels cut the continent of North America in two. In the east, the long spit of land called Laramidia existed and thanks to the wealth of fossil finds from Alberta, Utah and Montana a great deal is known about the dinosaur fauna that roamed the eastern part of the divided landmass. The fauna of the western part, called Appalachia, is not well known in comparison. Fossil discoveries have been few and far between, much of the Cretaceous-aged fossil bearing material has been eroded away and not a great deal of sedimentary, fossil-bearing strata is exposed in the eastern part of the United States when compared to the vast open spaces of the west. Lots of information known about Laramidia ceratopsids but this is the first fossil ceratopsid bone identified from Appalachia. The leptoceratopsid fragment fits into a larger pattern of dinosaur evolution. It does not resemble any of the Leptoceratopsidae genera known from Laramidia. This suggests that as the landmass of Appalachia became more and more isolated, genetic divergence occurred with the isolated dinosaur species evolving different forms from their cousins in the east. Many of the dinosaurs from Laramidia resemble Asian dinosaurs more closely than those identified from Appalachia. Tyrannosaurus rex for example, had an Asian cousin Tarbosaurus bataar. There is also a close resemblance in Hadrosaur faunas. From time to time as sea levels rose, the northern tip of Laramidia was able to connect with Asia, a land-bridge was formed and this enabled periods of fauna exchange between the continents to occur. However, Appalachia remained an island for much of the Late Cretaceous and this permitted a largely unique dinosaur fauna to evolve. Dr Longrich’s paper on the Leptoceratopsidae maxilla has been published in the academic journal “Cretaceous Research”. Thanks to his keen eyesight whilst exploring the Peabody Museum, the Late Cretaceous dinosaur fauna of eastern North America is well and truly in the spotlight.